To explore Antarctica, Sir Ernest Shackleton had to live on floating ice sheets after his ship was trapped and eventually crushed by an ice pack. 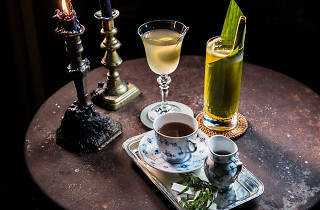 To get to Banzarbar, a Lower East Side speakeasy inspired by those 20th-century expeditions, one has to wander through a graffiti-tagged alleyway and wait on some floral couches. Same difference. 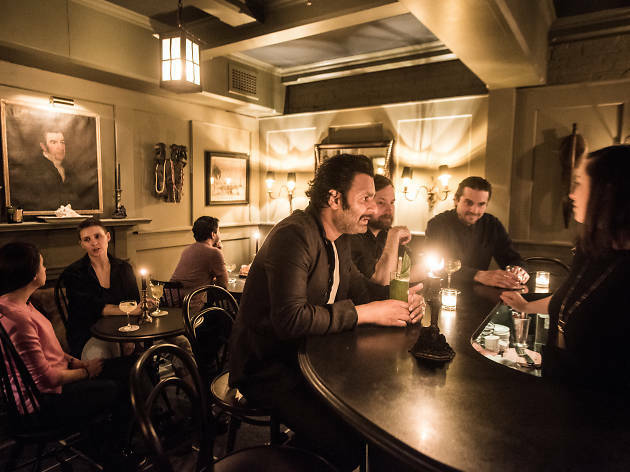 The intimate bar is tucked inside the second floor of Freemans, the perennial cool-person, gothic-farmhouse restaurant filled with diners that could be straight off the L train. The restaurant hostess seats you in a faux living-room corner before you’re invited inside by the bar’s host, who asks (but really insists) that you check your coat before entering the small space (which seems very antithetical to the theme, we might add). But the hype they build is warranted. 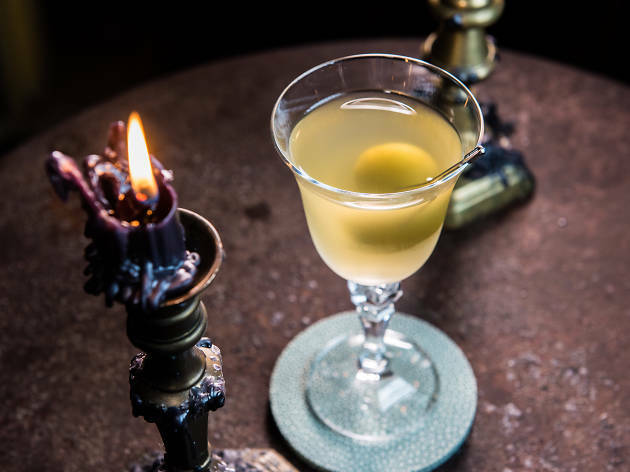 The dimly lit bar feels like a formal yet comfortable 18th-century seaside tavern, thanks to the olive-green paneling, seafaring paintings and burning candlesticks. 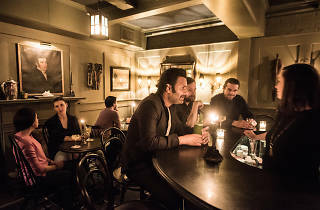 However, that’s where the nostalgia starts and ends: The thoroughly un-Colonial clientele in Warby-esque glasses and man buns are all drinking $18 cocktails with a modern-day flair. 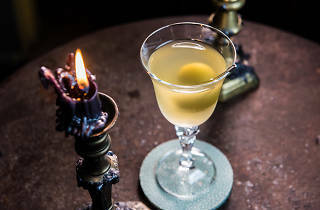 Before you take a sip of Tour Through Khari—a sweet, smoky and spicy mix of tequila, mescal, vermouth, turmeric, ginger and curry leaves—the waiter singes the top of a submerged banana leaf to evoke a campfire aroma. 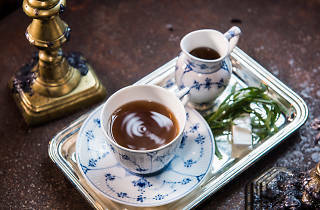 For Sons of Neptune, he smolders a pile of aromatic spices to elevate the smooth blend of rum, banana, sesame and angelica root. 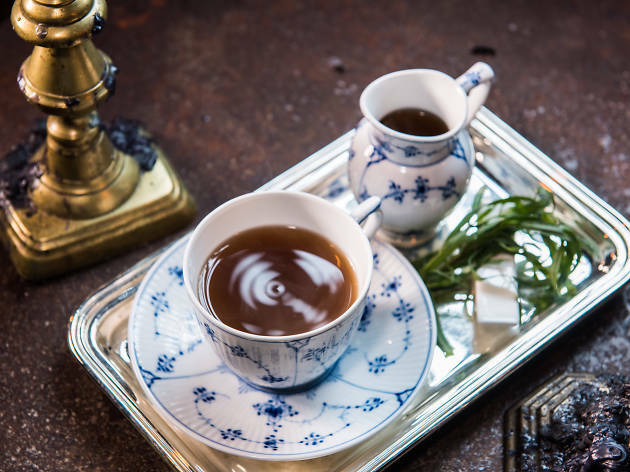 The warm apple-brandy–spiked Fortune and Glory comes in a cute blue-and-white tea set, a nod to its soothing honey taste. 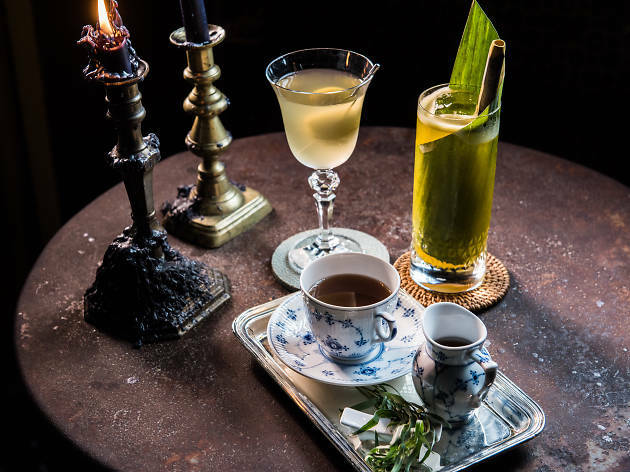 Thanks to head bartender Eryn Reece (Death & Co, Mayahuel), these theatrical touches enhance the harmony of flavors, rather than act as a distraction from any subpar quality. But that’s a rare misstep from this team that has carefully designed everything—such as the opening pour of grape-apple cider and the scrapbook-style menu, filled with iceberg photos—to prove that not all those who wander are lost.